Today marks my family's 250th author/illustrator birthday celebration! We have been celebrating author and illustrator birthdays for five years. On average we have four celebrations each month, and for the most part they go off without a hitch. However, this week's celebration for Vera B. Williams almost didn't happen. 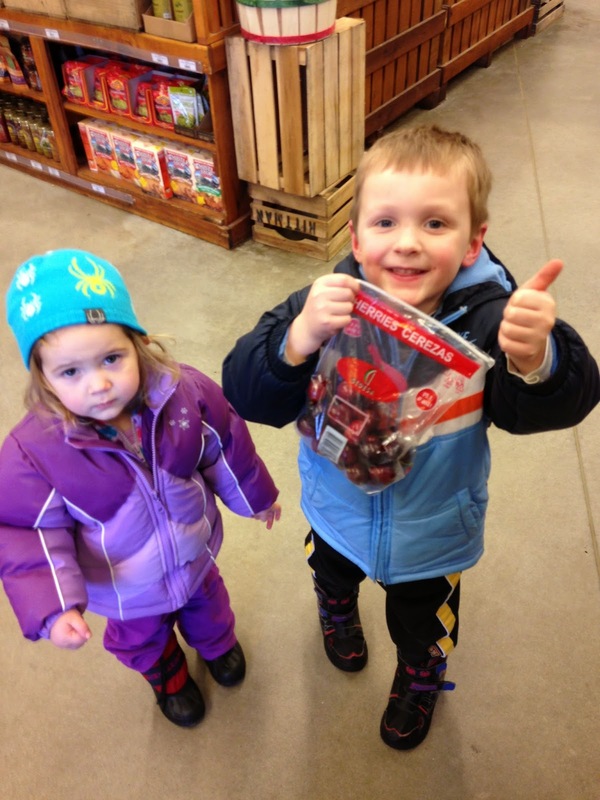 I never imagined it would be hard to find fresh cherries during the month of January in Ohio. But, thankfully we found some! The cherries were sweet, and tasted even sweeter as we enjoyed the perfect book. Vera B. Williams is the author and illustrator of two Caldecott Honor books; A Chair for My Mother (1983) and "More More More," Said the Baby: Three Love Stories (1991). Her life has been full of art, stories, and experiences worth telling about. 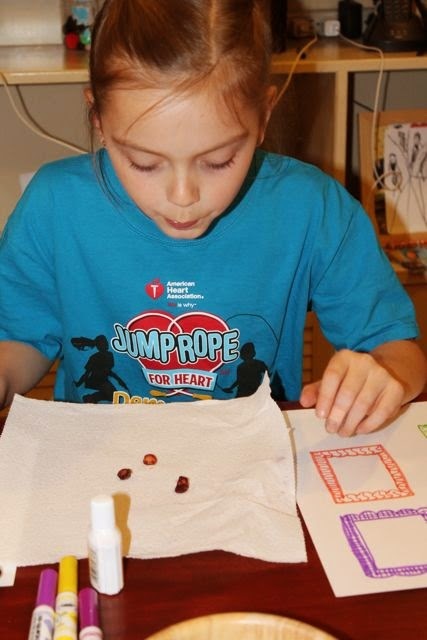 At the age of nine she showed promise as an artist when a piece of her artwork was exhibited at the Museum of Modern Art in New York. Her love of art led her to earn a degree in graphic art from Black Mountain College in 1949. After college she married, had three children, and taught a variety of subjects at a community school that she helped establish. 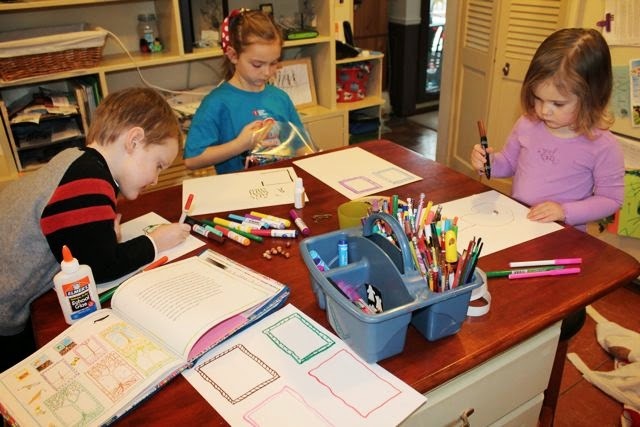 It wasn't until her children were grown that she turned her attention to making books for children. 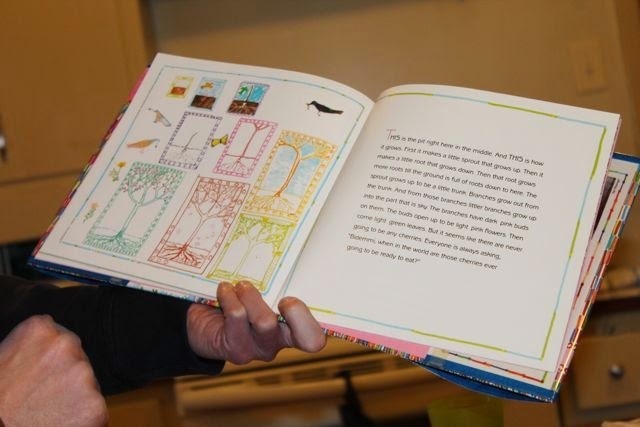 She illustrated her first book, Hooray for Me! by Remy Charlip and Lilian Moore in 1975 and the first book she both wrote and illustrated was It's a Gingerbread House: Bake It, Build It, Eat It! in 1978. Her most popular books are Three Days on a River in a Red Canoe, which was inspired by a 500 mile trip she took on the Yukon River, and her Rosa books; A Chair for Mother, Something Special for Me, Music, Music for Everyone, and A Chair for Always. 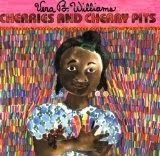 Vera B. Williams summarized her career, "So far I've found children's books a wonderfully accommodating medium where any of my various activities might pop up." (HarperCollins). 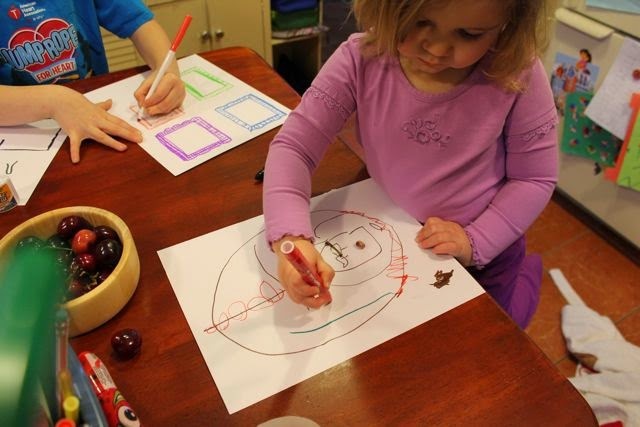 Cherries and Cherry Pits, a New York Times Best Illustrated Book and Boston Globe-Horn Book Award Honor Book, introduces us to a girl named Bidemmi who loves to draw with markers. Vera B. Williams said, "I am a person like my character Bidemmi. I have been impelled from my earliest years to imagine and describe my world in words and pictures." (PA Center for the Book). Bidemmi's drawings help her tell four short stories; one about a man who travels home on the subway to share cherries with his children, another about a woman who shares cherries with her parrot, and yet another about a brother who plays a find-the-cherry-guessing-game with his little sister. The last story is one that Bidemmi tells about herself. She plants cherry pits that grow into a cherry tree forest for the whole neighborhood to enjoy. I read this book before sharing it with my children. The storytelling is so good that I was pulled right into the apartment where Bidemmi was drawing her pictures. Each story is delightful. 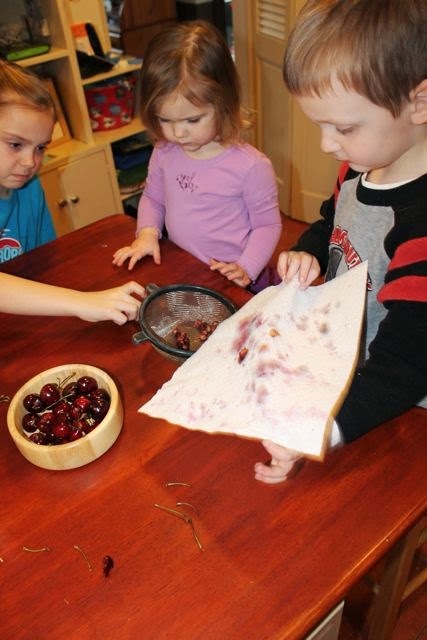 I loved hearing how cherries brought people together to share an experience together. I knew from the moment I read the last page that it would be the perfect book to bring together my family. I already had the book. All I needed was a bowl full of delicious cherries. 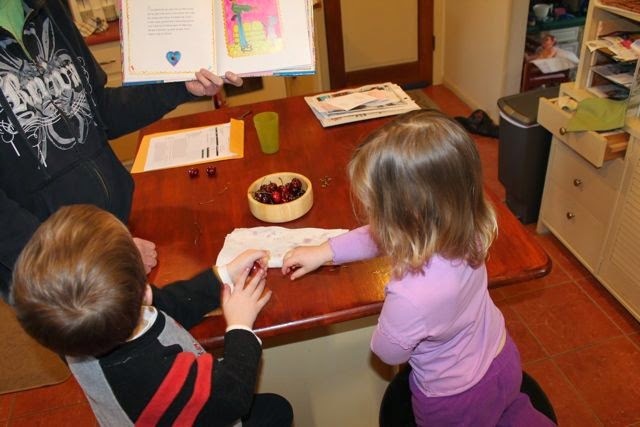 Last Friday, my youngest two children were home all day; no afternoon preschool for my son. We had a few morning errands to run. One of those being to stop at the local grocery store to pick up some cherries. My children knew exactly why we came to the store. 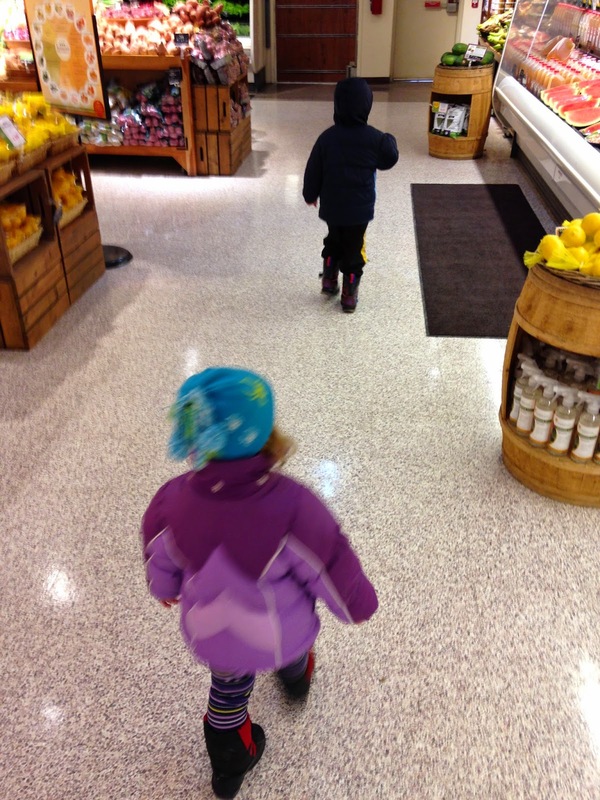 They ran straight to the produce section to find cherries. We walked around and around and around but couldn't find cherries. I even mistakenly pointed them in the direction of the grapes. I couldn't believe there weren't fresh cherries. I was blindsided. I thought, there goes my afternoon activity plans and our 250th author birthday celebration! In a moment of desperation we went to the aisle with the canned fruit. 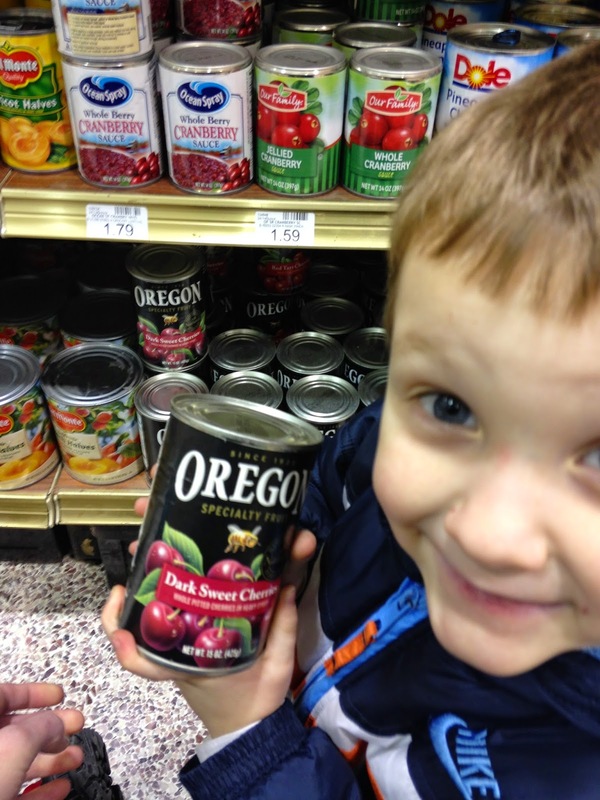 My son quickly pointed out canned cherries. I said, "We can't get these. They don't have pits! I want you to be able to spit out the pits!" We left the store disappointed, but I told them we would try another store. But, I worried that no store in Northeast Ohio would have them because it was January! 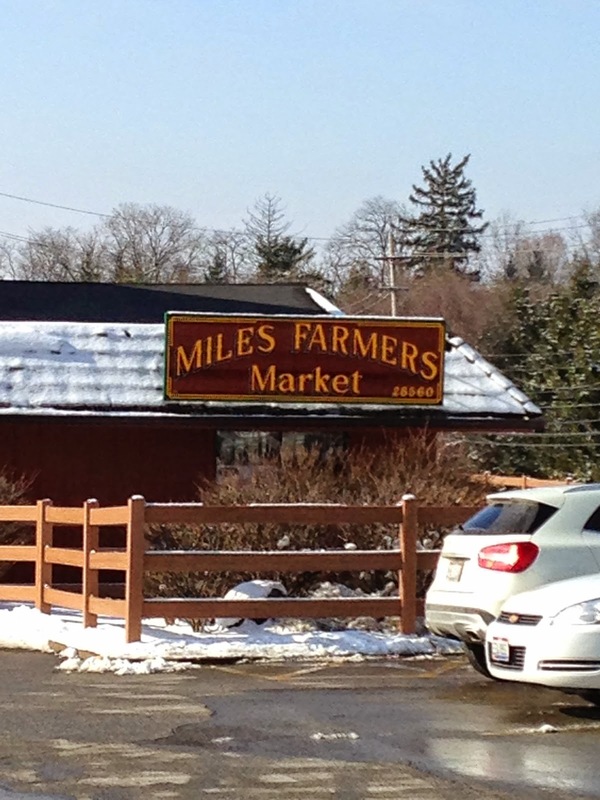 I called Miles Farmer's Market in Solon, Ohio and I was surprised when they said they had cherries in stock! I said, "We will be there after lunch! THANK YOU!" We found them! Red cherries shipped in from Chile for us to enjoy in January! I washed up the cherries, put them in a bowl, and set them on the kitchen table. My oldest daughter noticed the book and the bowl when she got home from school. "Can I have a cherry?" she asked. At this moment our celebration began for Vera B. Williams! 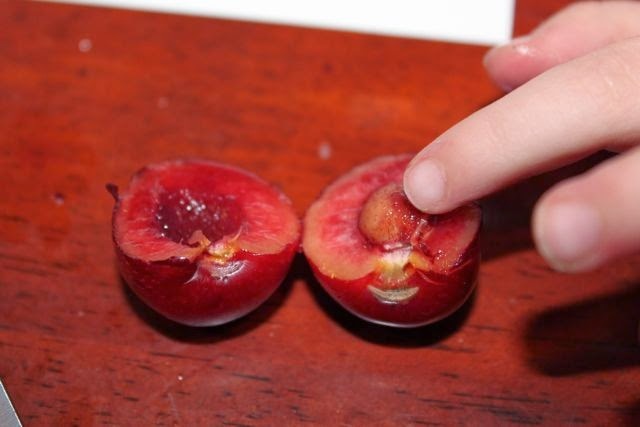 My son said that he thought this was his first cherry that he has ever eaten. He loved it! 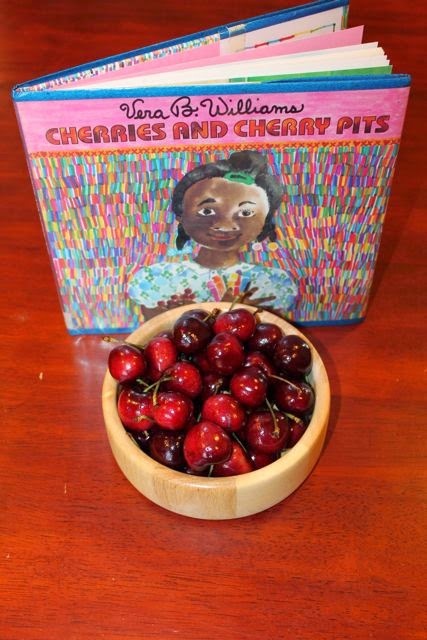 Cherries and Cherry Pits is a good book, but it became a GREAT book because we were able to hold cherries in our hand as we read the book. 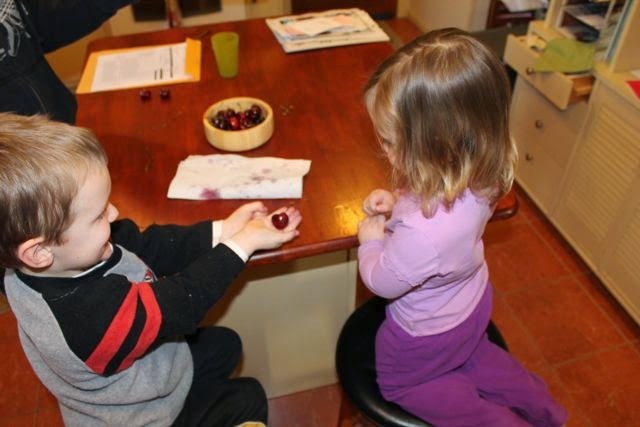 Brother and sister acted out the cherry guessing game just like the book. She was really good at picking the hand that held the cherry! This page in the book that inspired an art project. I loved the illustration showing how a cherry pit grew into a tree. 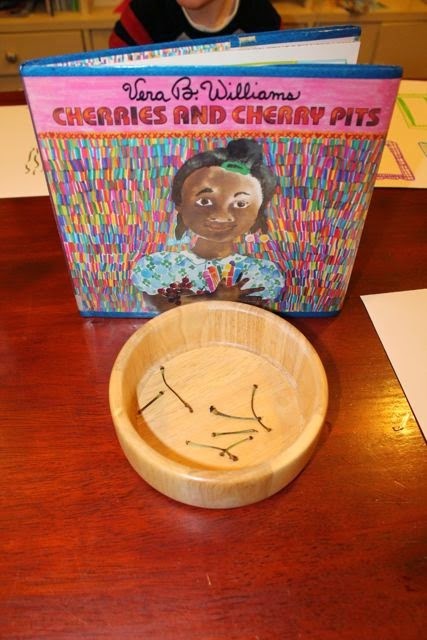 I wondered if we could make the our own illustrations of a cherry tree using the cherry pits from our cherries. There we sat, "eating the cherries and spitting out the pits, eating the cherries and spitting out the pits," just like the family from Bidemmi's first story. Then, we placed them in the strainer to clean. 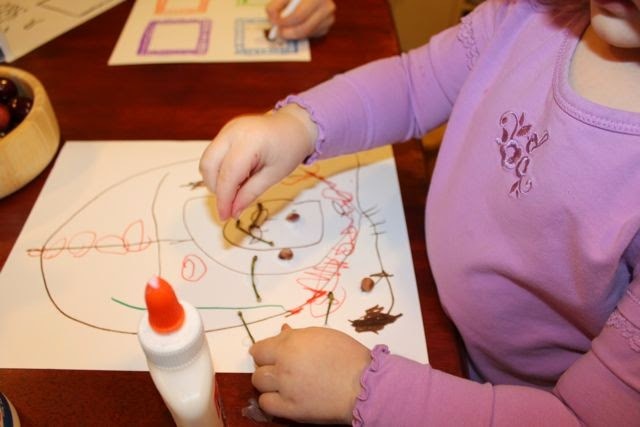 My daughter's drawing started by gluing a cherry pit on the piece of paper. They drew with markers just like Bidemmi. 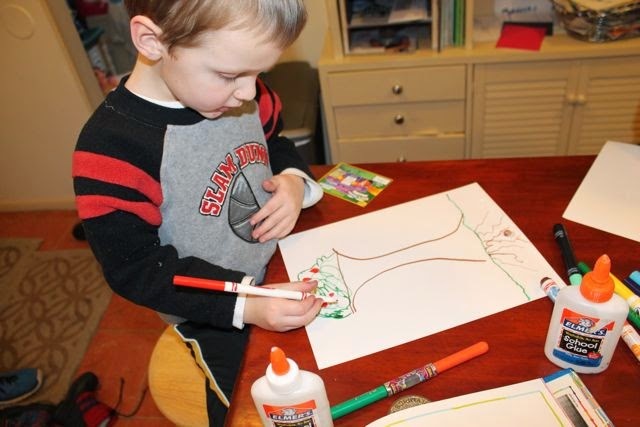 My son adds cherries to his tree. 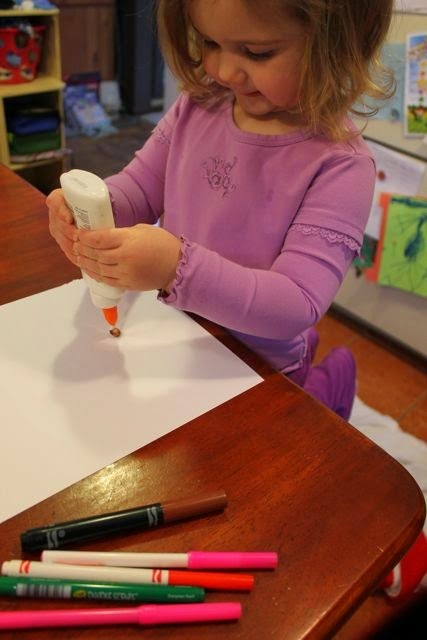 She asked if she could glue stems into her drawing too. 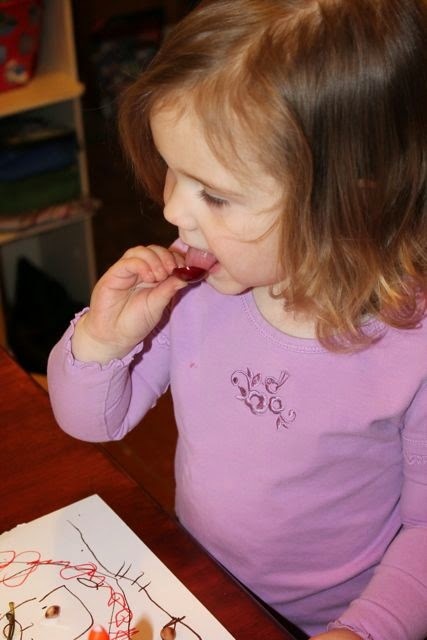 This was her first time trying a cherry and it started with a lick. It didn't take long for her to figure out that cherries were delicious. She ate so many cherries I was worried she was going to have a tummy ache! She said, "This is the pit." 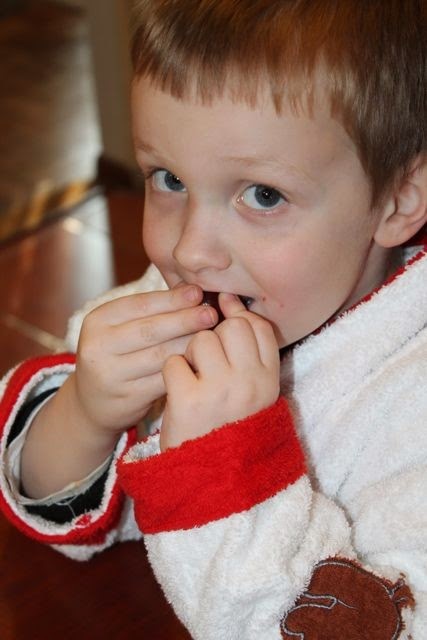 A champion cherry pit spitter! All the cherries, except for a few we saved from my oldest son, were devoured during this author birthday celebration! 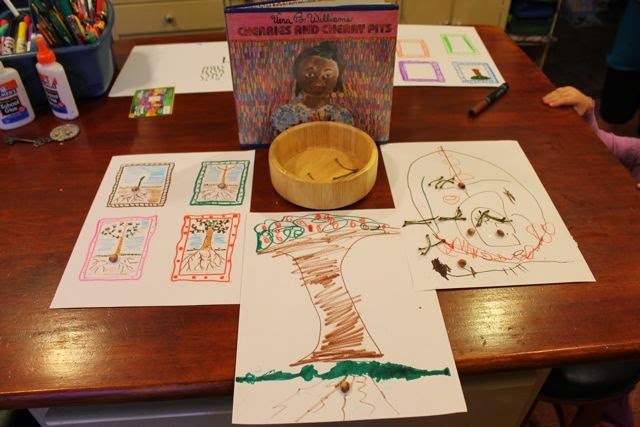 Artwork, a wonderful picture book, and a delicious treat brought our family together! I am thankful that this author birthday celebration happened! Happy Birthday, Vera B. Williams! Pin this picture and follow us on Pinterest!